U.S. corporations continue to take advantage of the accommodative conditions created by a protracted period of low interest rates and strong market participant demand. As of Oct. 1, 2017, U.S. investment-grade corporate debt issuance surpassed USD 1 trillion—three weeks ahead of 2016’s pace. Additionally, the amount of speculative-grade corporate debt issued through the first three quarters of 2017 is 17% higher than it was after the first three quarters of 2016. 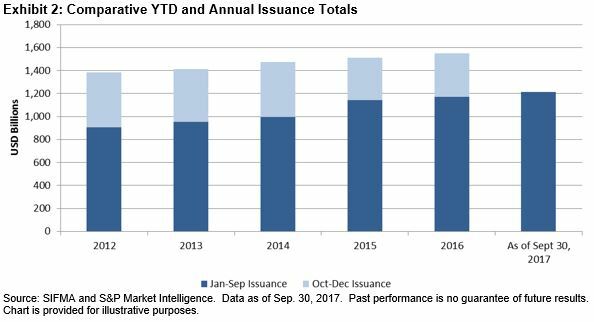 Combined, U.S. corporate issuance is on pace for another record year, which would mark the sixth consecutive year of increased corporate debt issuance (see Exhibits 1 and 2). Corporations have not only been issuing more debt each year, but they’ve also been extending the maturities in an effort to lock in low funding costs for several decades. In January 2017, Microsoft Corp issued a total of USD 7.5 billion of 30-year bonds with an average coupon of 4.2%. One month later, in February 2017, fellow ‘AAA’-rated Johnson & Johnson issued USD 2.5 billion of 30-year bonds with an average of coupon of 3.7%. Nearly 20% of the USD 1 trillion investment-grade debt issued YTD has been in 30-year term deals. 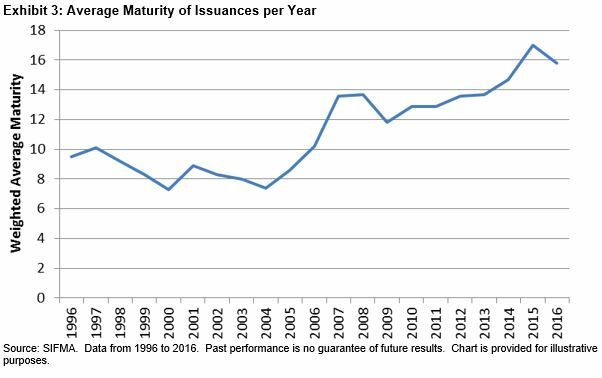 The average maturity of corporate issuances has grown significantly over the past 15 years (see Exhibit 3). 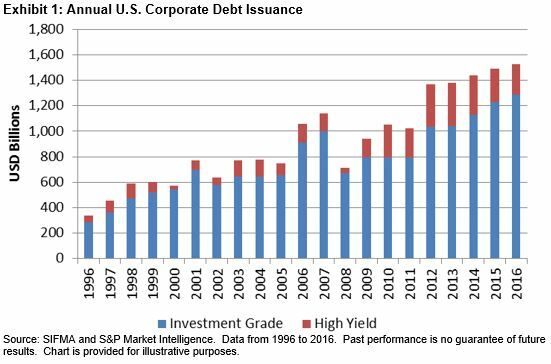 As a result of the continued increases in annual issuance amounts combined with extensions in average maturities, the total amount of U.S. corporate debt outstanding has more than tripled over the past 10 years. 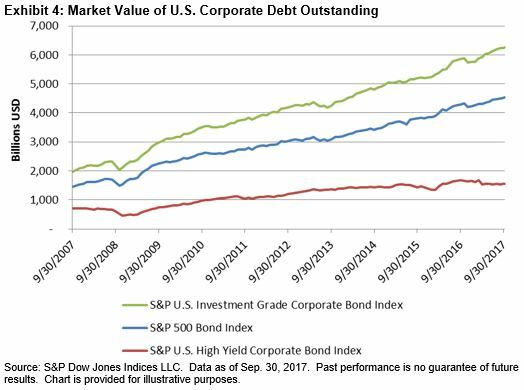 The par amount outstanding of investment-grade corporate debt, as measured by the S&P U.S. Investment Grade Corporate Bond Index, has increased over USD 4 trillion since September 2007, while the amount of speculative-grade outstanding, as measured by the S&P U.S. High Yield Corporate Bond Index, has increased by USD 800 billion. Over 60% of this increase can be accounted for by the companies in the S&P 500, as tracked by the S&P 500 Bond Index (see Exhibit 4). Given the record amount of corporate debt outstanding, U.S. corporations have increased the degree of financial leverage to well above pre-crisis levels. Perhaps more concerning is how corporations have chosen to use the proceeds of this record debt. Most companies have favored short-term shareholder wealth (in the form of dividends, share buybacks, and M&A activity) over longer-term capital expenditures. As U.S. equity markets continue to set record highs (in what seem to be weekly events), market participants may want to look at corporate capital management and, more importantly, how changes in corporate capital structures can potentially drive equity valuations.